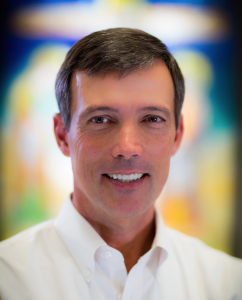 Robert Seelig leads Catholic Funeral & Cemetery Services (CFCS) as CEO and Founder. He created the vision for CFCS as “Church helping Church” and as such, he continues to look for ways to leverage its investment in resources by providing services to numerous organizations, rather than each organization building them on their own. Robert served as Vice President of Smith Industrial Supply Company from 1989-1997 and then purchased the third-generation, family-owned wholesale distribution business. The business grew with offices across the West Coast and they acquired a manufacturing business to complement their strategy. Five years later, US Filter, a publicly owned company, purchased the two businesses. Robert stayed with the company for five years, as a Vice President in charge of the Western United States. In searching for more meaning to his work, he left US Filter in 2002 to work for the Diocese of Oakland as Director of Cemeteries. Catholic Cemeteries of the Diocese of Oakland was at a crossroads, requiring new leadership and strategic planning. After renovating this cemetery system, he saw the synergies developing in the industry and both developed and acquired funeral homes to provide the community with a complete set of services. Upon completion of this strategic initiative in Oakland, there was a call for providing other dioceses with consulting and management services, which led to the launch of Catholic Funeral & Cemetery Services. Robert graduated from Loyola Marymount University in 1987 with a Bachelor of Arts in Political Science. He has been a frequent speaker at cemetery industry events and has become a sought-after collaborator on how the Church can create efficiencies, even as it delivers more effectively on this ministry.